Peugeot has sponsored an initiative by Paul Kerr to introduce Student Road Safety Awards and encourage awareness of road safety among young people. Paul Kerr's son, Jon-Paul, was 17 when he was killed in a car driven by an 18-year-old who had passed his test only a fortnight earlier. 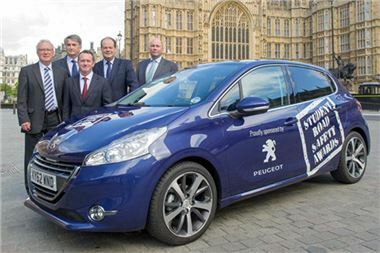 The bereaved father was determined that his son's death must not be in vain and after years of campaigning and lobbying, finally won parliamentary backing for the launch of the inaugural Peugeot Student Road Safety Awards, supported by the Department for Transport (DfT). Road Safety Minister Stephen Hammond today endorsed the UK's first ever student road safety competition, a concept put together by the father of a teenage car crash victim. The scheme is the first of its kind and has been developed by Mr Kerr, 68, to encourage students (future road users), aged between 11 and 18, to create unique projects that will help raise awareness of road safety in a suitable way for their age group. The winners' projects could be considered by the DfT as a potential future road safety campaign, designed to reduce or prevent deaths and serious injuries on our roads. The awards, which are sponsored by Peugeot and also supported by the Royal Society for the Prevention of Accidents (RoSPA). Mr Kerr, from Warwick, said: "My eldest son Jon-Paul was just 17 when he was tragically killed in a car crash; I refuse to let his death be in vain. Developing the Peugeot Student Road Safety Awards has in some ways been my way of coping with our loss. "It has been a long road to get to this point but I am very proud and grateful to have won backing from the Department for Transport, RoSPA and Peugeot. I like to think that Jon-Paul would approve. "Hopefully by raising awareness of the dangers on our roads in schoolchildren we can instil a sense of responsibility in all ages. There have been many road safety initiatives in the past but this is the first one aimed at and created by young people." Tim Zimmerman, MD of Peugeot UK, added: "When Paul came to us looking for support we knew in an instant that we had to get involved. This is an inspirational initiative that will help to educate and potentially save lives and reduce serious injuries on our roads. Peugeot is proud to sponsor this worthwhile and important venture."